Enjoy a delicious, new way to serve up the first meal of the day! 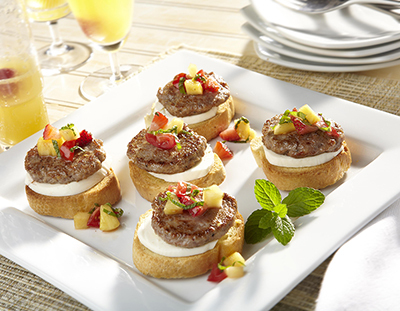 Juicy strawberries and Johnsonville Breakfast Sausage Patties combine with the fresh flavors of mint and basil to deliver bite-size pieces of perfection. On a cutting board, cut each raw sausage patty in half and re-form into 16 mini patties. In a nonstick skillet, over medium heat, cook sausage patties for 6 to 8 minutes, or until cooked through and browned, turning often. Remove to a plate and keep warm. In a bowl, combine tomato, pineapple, strawberries, basil, mint and syrup; set aside. Place oven rack in the top third section of oven; set to broil. On a baking sheet, place 16 slices of bread, brush lightly on one side with olive oil and place oiled side down. Broil for 1 to 2 minutes or until lightly toasted. Using tongs, flip bread slices. Place 1 piece of mozzarella on each bread slice. Return to oven; broil for 1 minute longer. Transfer to a serving plate. Top each with a cooked sausage patty. Spoon 1 tablespoon of fruit mixture onto each patty and serve.